A fish tank, also known as an aquarium, is a tank, bowl or other water-filled enclosure in which aquatic plants and animals – usually fish, and sometimes invertebrates, as well as amphibians, marine mammals and reptiles – are kept in captivity. Fish tanks are typically made of glass or high-strength plastic. Fish tanks were common in ancient Rome, Egypt, and Asia. Early Sumerians were known to keep wild-caught fish in pools, before preparing them for meals. In China, selective breeding of carp into today’s popular koi and goldfish is said to have started more than 2,000 years ago. 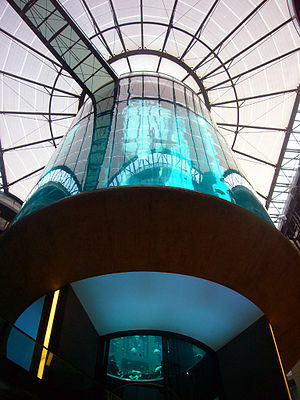 The first fish tank to have been made of glass (dating to 1853) is on display in Regent’s Park, London. Fish tanks usually contain fresh or salt water at tropical or cold temperatures. The conditions and characteristics of the fish and other inhabitants help the owner to decide what sort of water or plants need to be in the tank. A careful aquarist always tries to maintain a fish tank in a manner that resembles its inhabitant’s natural habitat. The water quality is very important, and this means controlling the inflow and outflow of nutrients. The maintenance of a fish tank also requires the careful regulation of temperature, light, and oxygen, controlling the waste produced by tank inhabitants, suitable species selection, management of biological loading, and good physical design. Aquarium keeping is now a popular hobby around the world. The fish tanks vary in size from a simple bowl housing a single fish to composite simulated ecosystems with carefully engineered support systems. A typical home aquarium contains a filtration system, an artificial lighting system, air pumps, and a heater. Additionally, some freshwater tanks (and most saltwater tanks) use power heads to increase water circulation. Many universities, marine stations, and wildlife commissions often maintain large freshwater and saltwater fish tanks for research and breeding purposes. Fish in tanks require Environmental Enrichment!